BlytheLife.com » Interview with Kimberly of Rosiee Gelutie & Giveaway! I first met Kimberly in Portland in 2011! She was one of the first Blythe people that I met “in real life” and she made me feel welcome at my first ever Blythe meet. I asked her if she’d be interested in doing an interview with me for BlytheLife and fortunately she was! She’s the mastermind behind Rosiee Gelutie, to learn more – continue to read! Hi Kimberly! 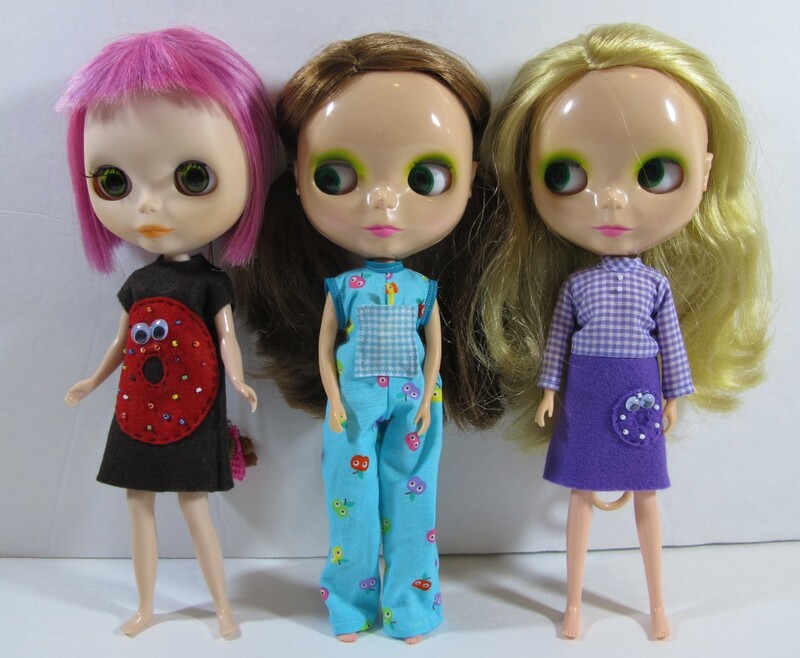 What can you tell us about yourself and how you discovered Blythe? I’m a 41 year old Hair Stylist with a Mortuary Science Degree. I had seen pics of Blythe around and was always drawn to her. I remember seeing a book in a bookstore that had Blythe doing everyday things. I loved that book but couldn’t afford it. In 2001 I was at a toy show and there were tons of them (the whole first BL series). 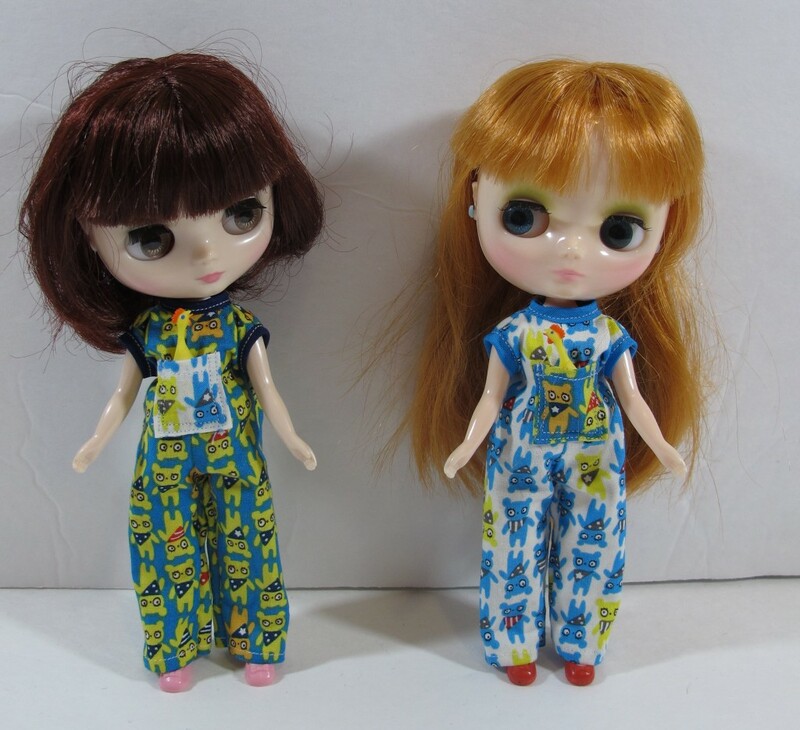 I bought my first Blythe that day (a BL Hollywood) for $50. I was so excited to own one!!! Had I known then what I know now I would have bought one of each! How big is your Blythe family? Who’s your favourite? I have 45 Blythes (this includes 2 Blybe’s that are my mini me and my bestie’s mini me, 3 Icy’s, 2 Middie’s, a Jecci 5 and an ADG). Gertie is my very favorite Blythe in the whole wide world, aside from Gertie’s Bestie Elouise. Where does the name Rosiee Gelutie come from? Rosiee Gelutie is an anagram of My Bestie Mandy’s girl Elouise and my girl Gertie! I tried many combinations before I settled on Rosiee Gelutie. 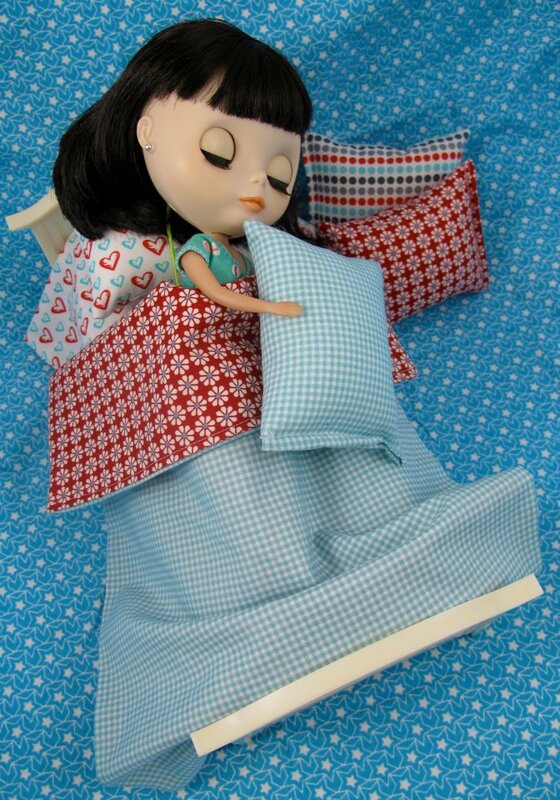 How did you get started in sewing for dolls? I started sewing for Blythe because I love crafting. The very first item that I made for them was a Donutzie. I wanted to create a Pal that could be held by them and be fun. What made you decide to start selling what you make? I knew that I wanted to open a shop to sell items that would allow me to visit my Best Friend in Australia every other year. I thought it be selling knitted hats, bags and aprons for Humans. 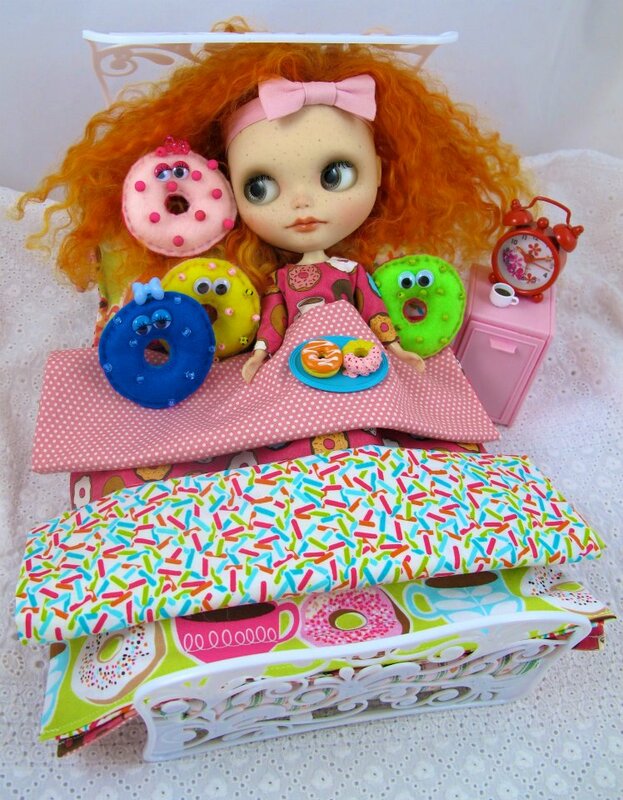 But it ended up being Donutzies and Clothing for Blythe! What went through your mind when you made your first sale? How about when you first saw something you crafted (and sold!) being photographed? I was tickled! 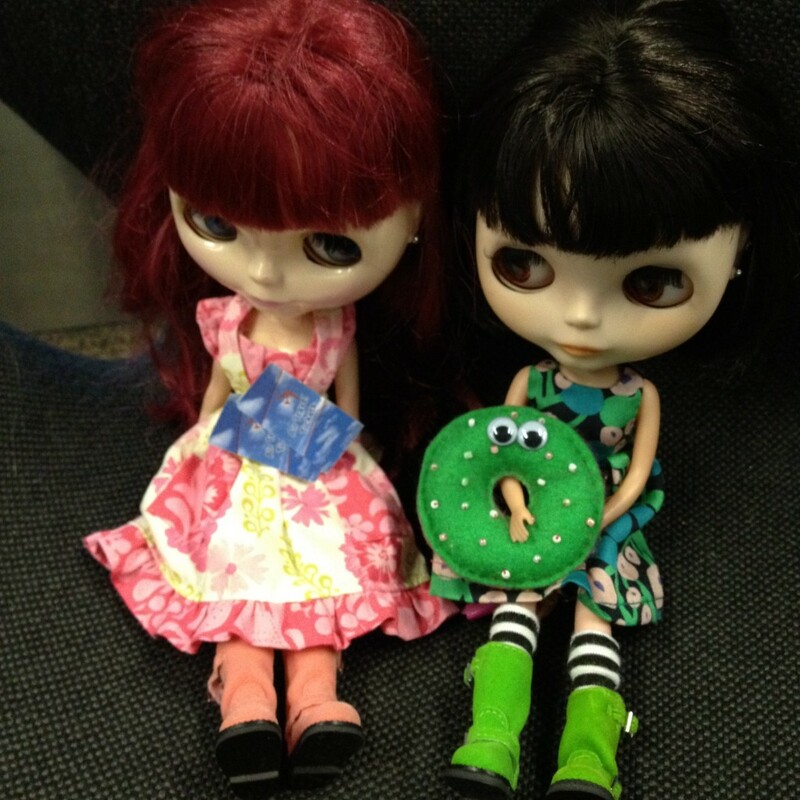 My very first Blythe item sale was a Donutzie. I was super excited to package him up and send him off! And the first time I saw an item that I made photographed, it made my heart warm. I still get a huge smile on my face every time I see someone’s girl in an outfit or bedding, or with a Donutzie that I’ve created. What has been your biggest learning curve when you went from sewing for humans to sewing for dolls? I did some Costuming when I was in College (I was a Theater Major before Hair and Mortuary) and I sewed some items for myself but I never enjoyed it. I always felt like I was fighting the machine and lost in construction. When I say that I thought I would make bags and aprons in my Etsy shop, I thought I’d fight my way through it (I’d only made a few aprons and never a bag btw)! It wasn’t until I started sewing for Blythe that construction and pattern making finally made sense! I just finished making a bag for my Mom for her Birthday and it all made sense! I’m actually gathering tools to make a shirt pattern for myself now. Sewing Doll Clothing has changed my whole approach to and understanding of sewing! All crafters have their own routine when they have the time to sit down and craft, what’s your routine? I think my only routine for sewing in to go into my Hobby Room. That is my “special” place. I walk in and if it’s an utter disaster I have to clean it first and while cleaning I’m looking at the items I’m putting away and gaining some focus for creation. Then if I’m in a mood to cut things out, I’ll sit on the floor in front of my mini ironing board and do that. Or I’ll start sewing or just picking out fabric that is calling to me if that’s what I’m in the mood for. I usually have the Netflix cued up on my ipad (I’m really into Miami Vice right now). I like everything organized and a spot for everything. I love simple lines and late 60’s to early 70’s designs. I keep building on to patterns I’ve already created. Just thinking of new things to add (sleeves, collar, buttons) or to shorten this or lengthen that. Sometimes someone will say “I’d love to see more of some type of item” and I start sketching away. Sometimes I sew something weird and then think if I do this and put this here… Hey! New pattern! Accidents can be happy creations! 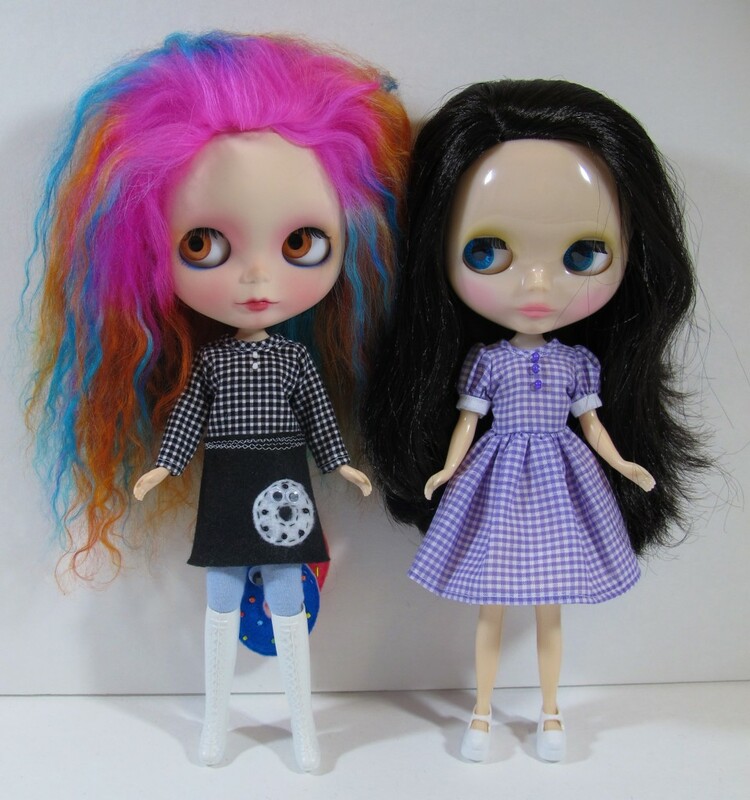 What has been your favourite piece of Blythe clothing that you’ve made so far? Which Donutzie has been your absolute favourite? I love challenging myself to learn new things. I also really enjoy try to achieve the goals that I set for myself. What would you say is your most irreplaceable tool for sewing and crafting? My iron. From start to finish I’m using this tool. I couldn’t sew without it! How have you improved as a crafter? What tips do you have to share? The first thing that I attempted to sew for Blythe were made out of felt. I created Donutzies and then a simple dress pattern. Then I progressed to Slacks (made out of fabric) and Bedding. After Blythe Con Dallas I had a lot of ideas but lacked the skills to do more advanced things. So for months I labored at learning how to make patterns, set in sleeves and collars. I’ve gotten better at making patterns and at adding more details to items. It’s been a slow but steady process. I hope to continue to improve and evolve. What can the Blythe community look forward to you in the future? I’m not really sure but I will continue to work on creating new patterns and styles as they come to me. I will also work on improving the items that I make with practice. Thank you for doing this interview with me, Kimberly! What kind of advice do you have for someone who’s new to the hobby? You can find out more about Kimberly on Flickr, Facebook and at her shop on Etsy! Donutzie Playsuit & Donutzie Giveaway! 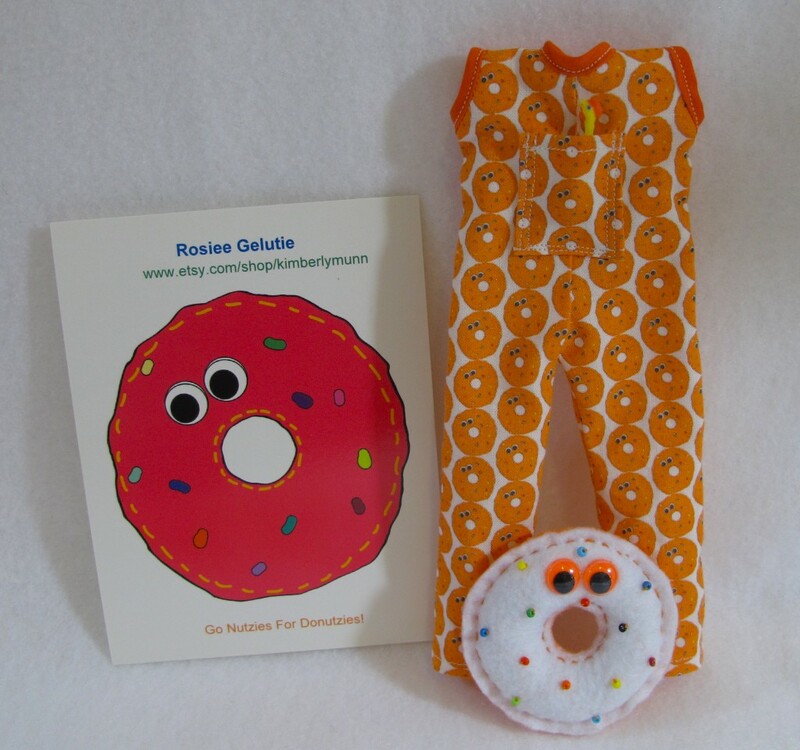 Kimberly has generously decided to giveaway one Donutzie Playsuit and matching Donutzie to one lucky reader here on BlytheLife! The giveaway runs until Saturday May 18th 2013 at 11:59pm Pacific. The draw will be held on Sunday May 19th 2013 and the winner will be announced on BlytheLife.com. Remember to use a valid email address for all comments. If you win, your email will be forwarded to Kimberly so she can get in contact with you regarding sending you the prize. Awesome interview. Really great to learn some interesting facts about Kimberly! Love the story. It was very inspirational for me. I adore Kimberly. Such a generous free spirit. Thank you for running this raffle you guys! 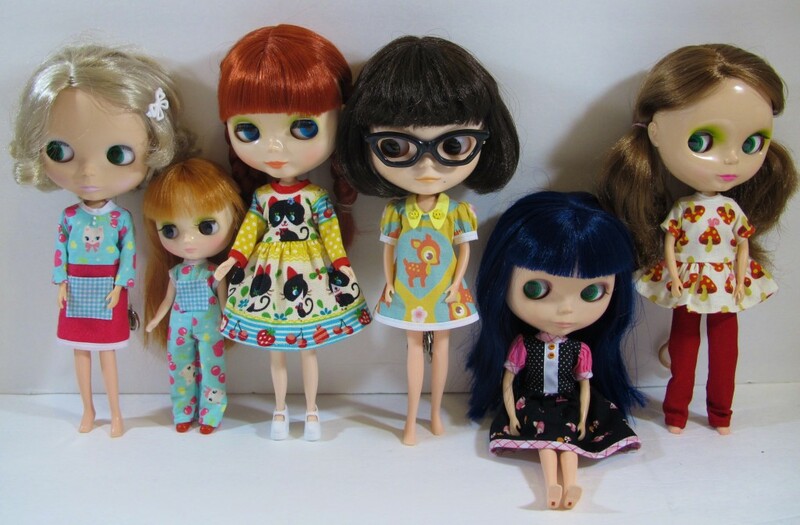 I not only love Blythe (still have to have one but I will! one day!) but I learned some important business tip, nice interview. She’s very generous indeed, the clothing is beautiful! Great interview and I love the story. I just love learning about other Blythe lovers. Your articles are always fun to read. I am a fan of Rosiee Gelutie and of Kim. She is a lovely person with lots of cute ideas. I enjoyed this interview very much. I’ve loved Donutzies for ages but have not got one yet, but after reading about Kimberley it warms my heart to them more! If I don’t win this one I have to buy one! I just love Kimberly and her creations!!!!! Keep on Keeping on, girl! What an interesting interview – the sewing clothes bit really resonated with me 🙂 – I shall persevere. The clothes (and their models) are lovely and those donutzies are extremely adorable. Thanks too for the advice to newbies. I just love the donutzies, they are so fun! Great interview, and thank you for sharing with us. oooh I love the donitzies!!! I love it!!! You are doing such a fun and nice outfits! I am totally in! Loved reading your interview Kimberly! I always wondered where the name Rosiee Gelutie came from and I was hoping you would find Limey!!!! 🙁 Thank you for sharing! :). I love my voodoo donutzie!!!! I just love Kim’s creations! winning this giveaway would be a wonderful bday present! we love love love kimberly! Rosiee Gelutie Fashions are fun and adorable!! Big hit at our house!! just love Kimberly & the donutzies & donutzie outfits! All my girls feel comfy in the dresses, playsuits & other outfits! Never had a an actual donutzie though – still need one! We love Rosiee Gelutie so much that my Blythe’s refuse to cooperate getting dressed into anything else! So unique, fun and fresh! Talk about making a statement! Thank you Kimberly for sharing your talents! Kimberly you know I love you & your clothes & of course donutzies! I am honored to have RG clothing for my girls – someone is always in at least one piece 🙂 HUGS! P.S. How wonderful to hear you have 45 girls! LOVE, LOVE LOVE THESE! THANKS FOR THE GREAT GIVEAWAY! Thank you for the great interview! It is always fun to hear the background of every creative artist! What a lovely interview! Kimberly seems like such a sweetheart who enjoys what she does. It was a first for me to hear about her and her incredibly adorkable donutzies. She’s definitely going to be my next etsy purchase! Awesome interview, i love your creations! Your donutzies are awesome!! What a great interview!!! Kimberly is one of the sweetest and most giving people that I know!! ?